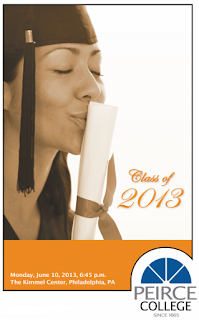 Commencement 2013 is finally here! I know that today's ceremony marks the culmination of years of hard work for our graduates who have been looking forward to this day. We can't wait to see everyone decked out in their caps and gowns, ready to walk across the stage to accept their college degree, and then using their degrees to move into the next chapter of their lives. Tonight's festivities will begin at 6:45 p.m. sharp at the Kimmel Center's Verizon Hall, and here's everything you need to know about the ceremony. Ceremony open. Kerri Kirlin, a Business Administration major with a concentration in Professional Studies, will start the ceremony by singing the national anthem. Kerri is our 2013 Peirce Idol, and she was chosen by our Facebook fans and judging panel to hold this distinct honor. Keynote speaker. Lisa Nutter, President of Philadelphia Academies, Inc., and the First Lady of Philadelphia, will deliver the keynote address. Ms. Nutter is passionate about expanding economic opportunities for students and young people, and setting them on a positive path. She'll share some words of advice with graduates, and was kind enough to give a sneak peak of her speech when she visited campus a few weeks ago. Student speaker. Elsarra Elamin is an international student from Zimbabwe and Sudan and is our 2013 student speaker. Elsarra has succeeded through many challenges in her life, including earning dual degrees. She will cover her academic and non-academic accomplishments in her speech. Her determination to earn her college degree showcases the caliber of all of our students. Parent University. Seventeen students from our Parent University program will graduate with their degrees during tonight's ceremony. In 2010, Peirce and the School District of Philadelphia offered parents of Philadelphia school children the opportunity to earn their degrees to help them get ahead in their careers, move to more fulfilling job paths, and set the example for their children about the importance of education. Seven of these graduates plan to continue their education, and we couldn't be more proud to have provided the catalyst for them to reinvigorate their passion for lifelong learning. Interviews. WURD 900 AM will be broadcasting live from the Kimmel Center tonight and interviewing several Peirce graduates and alumni about their educational journey, so be sure to tune in, starting at 4 p.m.! Closing song. The class of 2013 voted, and the closing song for this year's ceremony will be "Firework" by Katy Perry. Check out the press release we issued today with these details and more. We hope everyone enjoys tonight's ceremony, and we look forward to seeing you there.